The Farmville Chamber of Commerce is a voluntary organization of business and professional men and women who have joined together to promote the civic and economic progress of the community. Through cooperation of effort, members of the Chamber of Commerce endeavor to improve the conditions under which trade, commerce and industry are conducted, in order that the community may grow and develop. 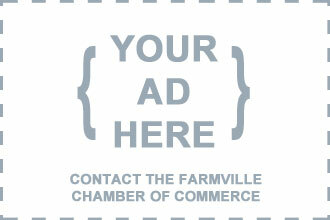 The Farmville Chamber of Commerce protects and promotes the general welfare of the community it serves. The area's economic stability and future growth is directly related to the clarity of vision and caliber of work of the Chamber. The Farmville Chamber of Commerce has a major impact on business, local income, and future growth of the town and surrounding area. Exciting things are happening and we don't want you to miss out! Stop by and visit to find out why now is the best time to join.